In Return of the Taxidermist, Jacob Sardini is persuaded out of retirement, back into the world of competitive taxidermy and is representing Mega City One in the 2116 Mega-Olympics hosted by Nepal. However, the physical and emotional pressures he is under are amplified when the military force him to robotically animate the recently killed Mahama, Nepal’s spiritual leader. This is probably one of the best strips The Megazine has run is a long time. The first thing to note is that any tiny doubts I have expressed about John Wagner recently have been instantly dismissed by this tale. Joining him as artist is the excellent Ian Gibson who none of us has seen for ages and who has probably been away gallivanting in American comics. They work brilliantly together, pitching this tale perfectly, getting the balance between humour and dignity absolutely right. Sardini’s skills, subtlety and inspiration in his field that lead, eventually, to him winning the gold over his much younger competitors is a totally appropriate analogy to how this strip and its creators might appear compared to their current peers in The Magazine. Every line said and drawn by the pair is perfectly considered and timed. A couple of other observations about this strip for you; It’s confusing as to why, on the cover I’ve uploaded here for today’s entry, Gibson’s image is reproduced so small. It looks as if it was originally drawn as a full cover image and yet for some ill informed reason, somebody (I’ve decided to blame editor David Bishop) has decided to shrink it down and fill the space left with dreary text. Some of the covers for The Magazine recently have been very unappealing so to see such misguided editorial design executed here is just so baffling that I’m feeling almost cross at my perceived arrogance behind the decision. I don’t think it’s unreasonable to think that the animated staring competition sketch that appeared regularly in TV’s Big Train can be traced to this strip. My memory is that Graham Linehan, one of the shows writers, picked up a copy of The World Stare-out Championship Final from GOSH comics in London and contacted cartoonist Paul Hatcher about it appearing on the show. In Return of the Taxidermist, one of the Mega-Olympic sports is staring. The world of comics is a small place and I can’t help wonder if Hatcher had read the strip a few years earlier and then nearly forgot about it. I don’t remember The Megazine being such a training ground for future TV writing talent. This issue features a prologue to Pan African Judges by future Doctor Who writer, Paul Cornell. I’ve heard that he wrote for 2000 AD at one time but I thought it was way after this. 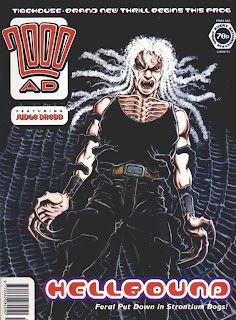 Another future TV name, Si Spencer, who goes on to script episodes of East Enders, delivers the final episode of Creep this issue, drawn by Kevin Cullen. In Creep, a group of Mega City One citizens go on a hunting expedition in old New York. Very quickly, they are captured by Creep, a feeble looking but powerful mutant who delights in killing the members of the party in uniquely cruel and imaginative ways. Cullens art is in black and white again. Obviously, he’s somehow been classed as the go to mono-art guy. As I’ve come to expect, his work manages to be both animated and atmospheric at the same time. My only criticism is that, on this occasion, I found it difficult to tell characters apart. Spencer is a writer whose earlier work for Fleetway I remember not liking for some reason. However, Creep is surprisingly engaging, which makes me wonder if he’s another writer I’ve unfairly misjudged. Creep is a deeply dislikeable individual who uses Bugs Bunny mannerisms to completely wreck the lives of individuals he has become fixated by. For me to so quickly want this vicious piece of work to receive his just deserts must surely be an indication that Spencer has written something very effective. We’ve already had two rounds of Mechanismo, now we’re part six of the way through round three. First time around, these stories in which Number 5 limps up from the under city and dispenses mad robot justice against innocent citizens annoyed the hell out of me. At one time, writer John Wagner would come up with an entirely new story idea for Judge Dredd every week, now he’s revisiting the same one over and over again. However, what we actually have here is a secret multi-part epic released to us readers in a new way. Admittedly, the first two rounds should have probably been published next to each other, but it makes sense that this one, set a year later, should be published that length of time after. Read relatively close to each other, as I have been doing for The Slog, the story is heavy with Wagner’s often flawless sense of timing and atmosphere. I was wrong to doubt him. Special mention should also go to Manuel Benet, an artist who, until this run, was known only as the single title “Benet” and fortunately has since seen the error of this policy. I recently commented here on how it might not necessarily be a good idea for new artists to get the prime gig of illustrating the Judge Dredd lead over established creators. However, Benet’s story telling is strong, his colours vivid and his characters clearly defined. His style might look traditional, perhaps a little old fashioned, but it’s almost a relief to see Dredd not being painted with veiny balloons stuffed inside his uniform. I’ve encountered an idiosyncrasy of The Slog recently which, actually, I’m surprised I haven’t come across more often before. (It goes to show how unknown this blog must be, I suppose). What happens when a creator of a strip gets in touch? 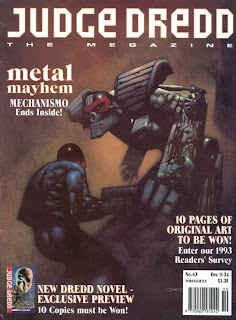 If you look at the comments to my entry for The Megazine issue 2.29, you will see a couple posted by PR man and Judge Hershey writer Igor Goldkind. If you’re a regular reader of The Slog you will be aware that I’ve not been particularly complimentary about another strip he wrote called The Clown. In fact, I said that, at one time, I considered it to be the worst 2000 AD strip ever, although after re-encountering it I retracted that statement despite still having some issues with it. My entry about his last Judge Hershey story was, I suppose, meant to be an ironic acknowledgement that I might actually have been wrong about Goldkind’s comic writing as I thought it was quite good. 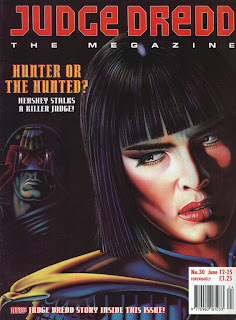 The problem with him having got in touch with The Slog and being so reasonable is I now find myself unable to assess the latest Judge Hershey story, The Harlequins Dance, with the clarity I felt I had before. It’s similar to how I feel when I encounter a Steve Sampson painted strip for The Slog. I used to be an acquaintance of his during the early days of his career and, because of this, I lack any ability to assess his comic work without any bias. Okay, I know, this is The Slog; it’s packed with sorts of biases and petty little preconceptions but once real people get involved it leaves me feeling a little bit impotent. In the case of Goldkind’s work, this is a shame because I genuinely did feel I was coming around to him. Instead, I now suspect we might never know if I would have completed that journey. Who knows, perhaps by the time I read the next Clown story, I’ll be back to my old self. I can however, talk freely about the art by Kevin Cullen. Cullen is a totally solid story teller whose work I’ve described before as looking like early David Lloyd. Interestingly, for The Harlequin’s Dance, scenes that take place in the Hannequin’s world are in colour. What I like about the art here is that Cullen uses pastel colours which not only look very attractive but reproduce well and hold the integrity of the strip. Suddenly, The Megazine is quite good. It had something of a re-launch last issue and all the new stories seem strong. As a whole, it’s still far from perfect, though. I find those Status Report pages that appear before each strip very off putting. They look lazily put together and give the impression that they are only there to pad the comic out. I also hate the next issue page that now appears on the back. It’s just a reproduction of the next cover which isn’t much fun and ruins the impact of seeing that comic for the first time when it comes out. Frank Quitely is back, this time drawing Shimura. Set is Holby City, I mean, Hondo City, it follows the investigation by Judge Inspector Shimura and Cadet Onaba of the slaughter of dozens of Endo Comm employees by the building’s own security system. As you would expect, Quitely’s art is great. Any criticism I might express here would be hair splitting so what’s the point. Robbie Morrison’s story is tight and, seems at least to me, complex considering the amount of space that it has. Considering that I would have read enough of Morrison’s work first time around to have formed an opinion about it I don’t remember doing so. 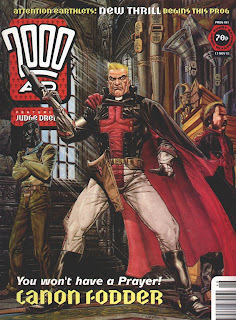 It might be interesting for me to re-encounter his work for The Slog considering I have a relatively open mind about it and he goes on to be such a fixture in 2000 AD. Traditionally the breaking area for new talent is the Future Shock. But 2000 AD, home of the Future Shock, seems to have re-established itself as the place to go for the cutting edge of mainstream comic creators. At the moment, they’ve got Morrison, Ezquerra, Yeowell and Hughes. The new talent zone seems to have shifted over to the whole of The Megazine. The new guys here demonstrate varying levels of ability. Charlie Adlard draws a Judge Hershey/Treasure Steel team-up in black and white and it looks pretty good. The story and characterisation takes priority for Adlard which, as regular Slog readers will know is my artistic preference. Chris Standley writes and Siku paints a one-off called Rapid Growth in which it’s established that 95% of the Oz population is fitness freaks. Despite the shaky plausibility of this premise taking place in a country built on barbeques and “tinnies”, it’s a fun distraction. The art is fully painted and, although not to my taste, shows promise. There seems to be a trend for single word artists recently because Xuasus paints the Judge Dredd lead, Slick Dickens – Dressed to Kill. S/he keeps the page design simple but the characters s/he paints look ugly, thick built and lacking in charm to me. 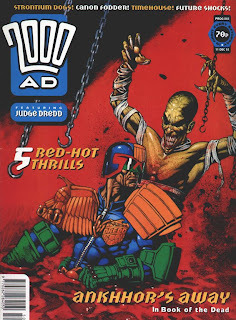 Xuasus shows promise but Dredd is a strip that an artist should aspire to and not start their career on. Having said that, long established writer John Wagner seems to be paying tribute to his own past stories here, much like Ennis has been in the weekly. This isn’t his best and certainly shouldn’t have lasted for two episodes. I don’t know why there seems to be a lot of new creators appearing in The Megazine. Maybe it has a limited budget and new talent is cheaper. 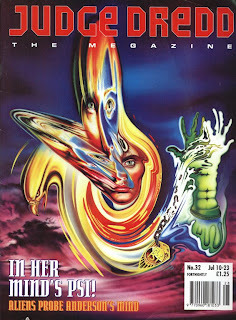 Maybe editor David Bishop is keen to establish The Megazine as having its own voice which is understandable. Whatever the reason, the result is a comic that doesn’t feel very special. Judge Anderson’s despondency about, well, all things leads her to taking a break on Mars only it’s not a break but another adventure. She’s part of a team investigating an alien pyramid on the surface of the planet. As they make their way through the structure, members of the team are picked off one by one so that all that is left is Anderson and the police officer who we learn was Orlok the Assassin all along. Now the aliens who advanced our evolution from ape to man are back and have decided to undo their “mistake”. Now that I’ve written it down, the latest Anderson PSI Division story, Childhood’s End, seems better than the actual experience of reading it. Writer Alan Grant succeeds at creating that sense of eerie foreboding that alien encounter stories of this type should have but, uncharacteristically, he fails at making the cast or the traps that kill them interesting. Furthermore, like us, Anderson seems swept along by the story rather than the focus of it. 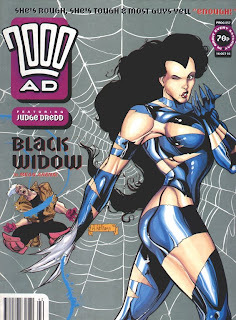 Kevin Walker’s art is probably very strong but reproduction in general at The Megazine seems poor recently. It’s only been the later episodes where things have improved that the strip has lifted. 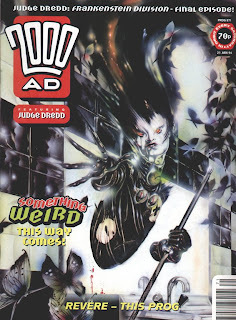 At this time, 2000 AD is going through a design overhaul and the bright, youthful Summer Offensive. The Megazine looks stale and old fashioned in comparison which is ridiculous considering that it’s the younger of the two. Thanks to her length of service, Judge Anderson in entitled to a period of introspection if that’s what the creators want to do but in this dour environment her depression is almost infectious. I want the cheeky, irrelevant, dynamic character she used to be back for all our sake. 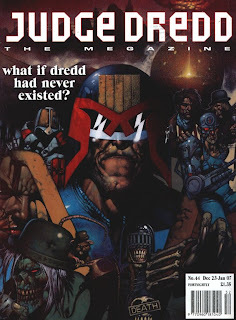 In case you haven’t noticed, we’re back at The Megazine, wading through stodgy stories that, in general, shrink the once vital future world of Judge Dredd down to the size of a tennis ball. It reminds me of those old black and white magazine sized comics Marvel used to publish during the seventies to compete with publishers like Warren. The covers are fully painted, the interior art larger, they’re written to appeal to your big brother and yet, somehow, they manage to be a lot less fun than the comics they spun out of. There’s something about the overall look of The Magazine that can make even a good strip in it look like a shopping trolley dumped in a canal. If you’re a good strip here, then you really do have to shine to be noticed, and The Missionary Man, by Gordon Rennie and Frank Quitely, is one of those. The Missionary Man features an enigmatic preacher who brings God’s word to The Cursed Earth in 2000 AD’s typically brutal way. The obvious creative star is artist Quitely, who arrives fully formed from his time at Electric Soup. His work is finely detailed, stylish, expressive, colourful, animated and well designed. In fact, it’s almost perfect. Rennie, although benefiting from working with an obviously excellent artist, pitches the opening self contained episodes perfectly. In no way ponderous, the two short tales still contain portent, drama and great one-liners. 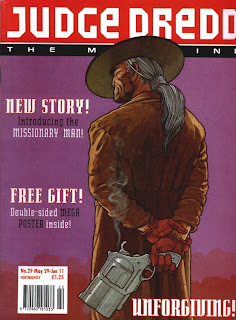 The Missionary Man blows though The Megazine like a gust of fresh air so it’s frustrating to see it only appear for two issues before going on a break and an ad for another upcoming strip to be drawn by Quitely with a different writer thus, I imagine, delaying its return. I’m abusing my position as keeper of The Slog again to let you know about my new book, Pbrainey’s Book of Lists. This is a full colour, 112 paged TPB collection of my diary comic strips. Suicidal birds. Edible guitars. Licky dogs. Smelly saddles. Selective helloers. These are just some of the real events from my life which I have ordered into lists and then drawn up as comic strips. Now available to buy, Pbrainey's Book of Lists collects over fifty of the popular internet strips in actual reality book form. 112 pages in full colour for £10.95. (Price includes post and packing to UK. International customers please visit The Shop for your Paypal button). Copies can be ordered using Paypal from my website. Or contact me directly for other methods of payment. You might remember me announcing here that as much as I dislike Michael Fleisher’s reinvention of Harlem Heroes that it wasn’t my least favourite strip in 2000 AD ever. It was The Clown. This is partly because I resented Tharg’s PR man, Igor Goldkind, being allowed to sell scripts to the publisher when he was clearly only doing it in his spare time, when the phone wasn’t ringing, as if, when it came to creating comics, it was just a hobby. During the eighties, I attended a small panel at a comic convention which Igor Goldkind, then Titan Book’s new PR man, seemed to take over. He was brash and over confidant. He handed out Watchmen promotional bumf, announced that he had never read a comic before getting the job and told us about this exciting new medium called “the graphic novel”. Tell us something we don’t know, Igor. You’re preaching to the converted here. Shouldn’t you be telling people like Gaz Top and Woman’s Own magazine this? I was wrong to describe The Clown as the worst 2000 AD strip ever, although having re-encountered a couple of stories for The Slog recently I still find it very irritating. 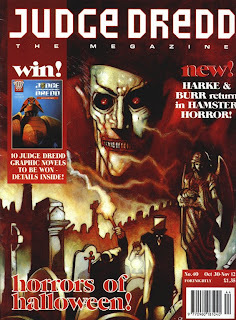 However, his current Judge Hershey story for The Megazine, A Game of Dolls is… okay. In it, Hershey investigates a series of prostitute murders taking place in a sector where the judges don’t seem to care very much. I find Judge Hershey in solo stories a bit pointless. As a character, she doesn’t seem to provide anything different to what we’re already getting from Judges Dredd and Anderson. Goldkind, like other writers before him, doesn’t add or elaborate anything new about her. He does, however, write some surprisingly tender moments while the story itself rolls along well and doesn’t out stay its welcome. He’s probably helped a lot by the artist, Kevin Cullen, whose style has the right balance between personality and story telling and whose David Lloyd inspired work I like a lot. I suppose it shouldn’t be a surprise that a PR man could write a good comic strip. After all, writing is their job. Journalists are fundamentally lazy bastards and if they can get the PR man to write a piece tailored specifically for their paper or magazine they work for and still get paid for it then they will. Goldkind probably spent all day writing and found it difficult to stop. 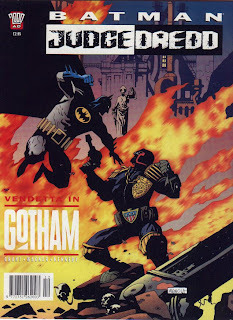 There’s no reason why this, the second meeting between Batman and Judge Dredd, shouldn’t be an improvement on the first now that it’s late enough in the series to be free from the weight of expectation but early enough for it to still feel special. In it, Dredd appears unexpectedly in Gotham and starts brawling with Batman, apparently, to teach him a lesson after last time they met. Meanwhile, the Ventriloquist and Scarface attempt to kidnap a congressman’s son. My recollection is that Die Laughing, the characters’ fourth encounter, had been announced by this time and my suspicion is that this, Vendetta in Gotham, was created after that was written as it took so long for Glen Fabry to paint. The result is a volume that feels thin and a story missing the content you would normally expect from an event such as this. Dredd encountering the Ventriloquist and Scarface, characters Wagner and Grant created for the Batman comic, feels like a missed opportunity rather than the big deal it should have been. Having said that, there remains much to enjoy about it. It’s great to see John Wagner and Alan Grant, who write together so infrequently these days, doing it again. I had almost forgotten how great their timing can be, how every moment can count. Cam Kennedy’s art might lack the detail that his early Dredd work has, thanks perhaps to this being completed to a tight deadline, but it remains weighty and with the right amount of environmental ugliness just the same. Of all the covers I’ve seen this week for The Slog, this is the best so far. Drawn by Dave Hine, it features Tharg in his semi-superhero pose, crackling with thrill power and surrounded by portals into the various worlds he provides us access to. Far more appropriate than upside-down genetic infantry men and grotesque mash-ups. Inside, it’s all new content throughout. There isn’t even a text feature which makes no difference to The Slog as I don’t read those anyway. 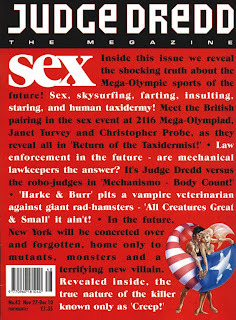 In general, the strips seem to fall into two categories; thrills such as Brigand Doom, Tao de Moto, Janus PSI Division and Manic 5 all of which are prologues or opening episodes to serials scheduled for the weekly in 1994, or Canned Heat and Tracer, prologues or opening episodes to new serials that we never hear from again. Thanks to Grant The Hipster Dad, 2000 AD blogger also and regular commentator on The Slog, who has solved the mystery of The Burning Man from the 1994 2000 AD Yearbook. Apparently, it, along with Canned Heat and Tracer, are strips created for a proposed new comic called Earthside 8 that never happens. According to Grant, “Basically, Fleetway concluded that there wasn't a "gateway" comic for 7-10 year-olds anymore to build a new audience for 2000 AD, and so they set to work on a new SF comic for readers in that age bracket, and then Fleetway changed their minds and pulled the plug.” You can read what else Grant has to say about it at Thrillpower Thursday. I have absolutely no recollection of this proposed comic at all which is frustrating as I’ve always fancied myself as astute when it comes to certain subject matters. It’s sad to learn about it now because, surprisingly, Fleetway were right to come to the conclusions they did about 7 to 10 years olds no longer being catered for by newsagent comics. Had it happened, perhaps the British comics industry in 2009 would be in a healthier place. That’s another cover to one of 1994’s Yearbooks that I don’t particularly like. Once again, the Judge Dredd Yearbook fails to fully utilise the panoramic opportunities of the gatefold sleeve for some reason while the image itself just doesn’t seem strong enough for an annual. In fact, I would say all of that eye sharing is a little off putting. Inside, however, the art is the star. Dean Ormston stylistically paints the opening Dredd strip written by Alan Grant. I was just thinking the other day how it seems that Grant hasn’t written anything for 2000 AD or The Megazine for ages and here he is suddenly. If I start wondering about Mike McMahon, maybe he’ll pop up too. Every annual or yearbook needs a special event and this year’s is provided by the return of artist Mike McMahon on Mean Machine. McMahon is currently going through his minimalist period which must have been a shock to those readers whose comic exposure begins with 2000 AD and ends with The Megazine as when last we saw him was working on the beautifully detailed Slaine. Of course, the simplicity of his current work is deceptive. The real genius is how every single figure, object and line is perfectly placed. Ultimately, however, the yearbook feels disappointing. It’s now in line with the editorial direction and design of the fortnightly which means that the yearbook has the same padding and backup strip preferences. The Armitage strip, drawn by Russell Fox whose art I really like by the way, is, mysteriously, twenty-one pages long. I find it difficult to believe that Armitage is either more popular or worthy than Judge Dredd who only gets sixteen pages of new material and whose yearbook it’s supposed to be. I’ve left reading the annuals, I mean, yearbooks a little late this time. It was because I was waiting for an appropriate break in the weekly that seemed to take ages to come along. First up, I don’t like that cover. It’s certainly well painted by Mick Austin; I’m just not too sure about the main figures floating by upside-down. There are certainly some very enjoyable original thrills in this year’s book. There’s a very smart Judge Dredd written by John Wagner that, perhaps, might have been more appropriately placed in last years more art themed edition given that ol’ stony face finds himself trapped inside famous paintings. There’s a prequel to the Tyranny Rex story that I recently finished reading in the weekly drawn by the excellent Paul Marshal. And there’s an enjoyable Robo-Hunter by the new and improved team of Peter Hogan and Rian Hughes which seems almost wholesome compared to the recent Mark Millar stories. 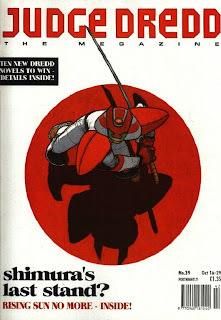 There’s Young Dave, by Millar, Grant Morrison and Steve Parkhouse, the adventures of Big Dave when he was a nipper. The tabloid editorialising that used to occur in the early stories seems to have been forgotten about in the newer adventures. It means that the strip sales even closer to the wind than before. I also get the feeling thanks to scenes where Dave has his dinner eaten by “two coloured lads next door” and another where we catch the tail end of a racist joke being told in a club that Young Dave could just as easily be used as propaganda for the right as it could be enjoyed as satire by the left. 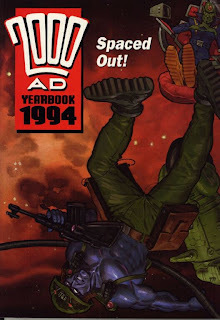 For some reason, Millar and David Hall’s Rogue Trooper strip is set in the original continuity. This isn’t the first time that this has happened since the character’s reboot but before I could put it down to error or justified stubbornness on behalf of the long established and respected Brett Ewins being the artist. This time, it’s as if there’s a significant movement for undoing the re-imagining that took place a few years ago. The biggest mystery in the book is The Burning Man by John Wagner and Carlos Ezquerra. In it, a hired assassin learns that he’s been infected with a terminal disease with no idea as to how it occurred. It reads like the opening episode to a really good series that never happens. Item: In Soul Gun Warrior by Shaky 2000, the artist formally known as Shaky Kane, Robert Oppenheimer uses his experimental new invention on patriotic American test pilot, Tim West. Kane’s story is just an excuse for him to draw Jack Kirby inspired machines and brawls in space which is fine by me as it’s what he does best, or second best, and is much more fun than , say, if it were being written by someone like David Bishop. Item: In Revere Book III, the angst ridden boy wizard travels beyond the veil to find his dead girlfriend this time. Clearly, John Smith is laying on the purple prose and Simon Harrison’s art is aesthetic stunning but I just can’t get into it. I think Book II ruined Revere for me. I would like to correct something I wrote previously though. Before, I said that Smith writes what he does irrespective of who is drawing it. In the case of Revere at least, this is one of the most obviously wrong things I’ve ever written for The Slog. Everything ever drawn by Harrison seems to have been written to accommodate his style, tastes and eccentricities. What a duh-brain I am. Item: Let me ask you a question. If you were a young man and you had the choice between sleeping in a nice, comfy bed every night with the woman you love or on a hard, stone floor under a single undersized sheet with two young women, which would you choose? That’s right, the second one every time. In Earth Mother, that’s exactly what Dex does, although I must point out that there is no suggestion of any impropriety going on. The characters might need work on their motivation and, although strengthened since I last mentioned it, the concept remains shaky, I’m enjoying Earth Mother more than I feel I should, none the less. It’s like a guilty pleasure. Item: Big Dave is back, and this time he’s being drawn by Anthony Williams. 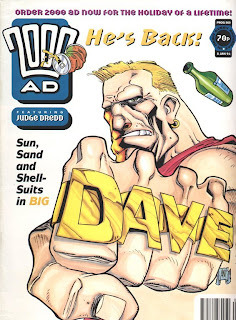 Normally, I like Williams but I much prefer Big Dave more when it was being drawn by Steve Parkhouse. Williams makes it slightly too grotesque for my liking. In Costa Del Chaos, Dave goes on holiday to Tenerife. What I want to know is, if Big Dave is unemployed, how is he able to afford to go on holiday in the first place? (That question has been kindly provided by The Daily Mail). Item: I’m fascinated by an ad that appears in this prog for Fake IDs. I imagine the purpose of a fake ID is to enable its underage carrier to get served alcohol in pubs. It’s surprising to me that a service like this can legally exist as recently as 1994 but then, for all I know, it might still be available. Apart from being credit card sized and laminated, how authentic looking these IDs are I have no idea. I have a suspicion that some Del Boy type has bought a laminating machine and turned it into a business. Item: Mother Earth is a curious new thrill. The concept seems to be that ‘Mother Earth’ travels back in time to prevent the occurrence of ecological disaster in her own time but when she returns to the present, she finds all new eco-atrocities occurring in the line she’s created. The concept for the strip at this level presents all sorts of interesting paradoxes and moral dilemmas that creators Bernie Jaye and Cliff Robinson decide to ignore altogether. Instead, she kidnaps three random young people to help her in her raids on multi-national companies. Personally, I don’t mind that Jaye and Robinson have decided to strip the thrill of all intellectualism, but I can’t see it lasting more than six episodes before its conceptual foundations give way and Mother Earth collapses in on itself. Merry Christmas, and to celebrate, one of my favourite thrills of recent times comes to an end this prog. In Canon Fodder, Judgement Day has nearly arrived. All of the world’s dead are alive again but God is nowhere to be seen. Sherlock Holmes and Moriarty have killed themselves (I didn’t know that they were ever really alive in the first place) to gain access to heaven with the intention of killing God. Doctor Watson has enlisted the help of Fodder and Holmes’ mad brother Mycroft to find a way to stop them but when the cast arrive in Heaven they find that it’s been invaded by Lucifer and his army. Apparently, God is already dead. All this in just seven episodes; It makes Millar’s co-written Day of the Dead look like the puffed out eight-parter that it is. Chris Weston’s art is absolutely brilliant. Canon Fodder is designed to look like an earnest Freddie Star. During the scenes set in the eras-clashed London the thrill has this great sense of claustrophobia. However, it’s the episodes set in heaven that excel. The leather clad Lucifer has an insect quality and God, who isn’t dead after all, has multiple faces but remains continually recognisable as he unleashes his wrath amidst the surreal chaos of Paradise in flames. You try drawing that! During a period when many comic writers hold on to their ideas or release them at a painfully slow rate, Mark Millar’s pop sensibility is refreshing. He doesn’t seem precious about them. In fact, he seems absolutely sure that as soon as he gets one idea down on paper another five will rise to take its place. I know that there are a lot of you that probably disagree with me but I think he’s exactly what 2000 AD needs at this time. In Book of the Dead, Judge Dredd goes on a cultural visit to Luxor where he learns that his invite wasn’t made to improve relations but because the local judges want to add his genetic purity to the essence of the immortal Ankhhor and make him whole again. Well, we didn’t see that coming. Some Slog readers who comment regularly here have referred to this story as being the one that ultimately drove them away from reading 2000 AD. Having just re-encountered it, I don’t see entirely why. Sure, it’s a story that doesn’t seem to go anywhere but there have been several adventures in the past by more respected Dredd that have been equally flat. In fact, Day of the Dead still has enough moments, such as Dredd’s “soft landing” at Resyk, for it not to read like a disaster. Joint writers Grant Morrison and Mark Millar might have been coasting when they wrote this one but I find it hard to be overly critical of it as it doesn’t seem to come from a particularly cynical place. 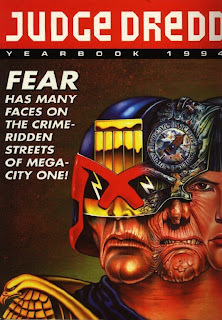 In fact, I almost respect its attempt to introduce something new to the world of Dredd, even if it is a bit rubbish. In Timehouse, a new thrill by Peter Hogan and Tim Bollard, a family try to clear up anomalies in time by moving creatures of myth, such as Big Foot, aliens and Father Christmas, to places where their presence no longer creates contradictions. It’s an okay idea that, if Alan Moore had been writing, would have been over and done with inside five pages of Future Shock. Instead, its run for six weeks so far, and consequently, reads overly twee and inoffensive. I’m worried that Hogan is more Neil Gaiman than Alan Moore. The time travel is more fairy tale than pulp sci-fi and all of the characters are nice and seem to get along well. There’s no place for this sort of thing on 2000 AD. This is where grim faced law enforcement officers fall into buckets of guts. It’s not where Santa turns up for a party with a bunch on cuddly sasquatches in a forest. It feels as if Garth Ennis has taken his time getting us there but, at last, Feral Jackson and The Gronk make it to planet Lyra to enact their revenge against the bone faced necromancers that killed Johnny Alpha. Personally, I feel that if you’re going to kill off the main character but continue the strip without him with a new creative team then the best thing to do would be to draw a line after what has gone before rather than dwell on it. Strontium Dogs The Darkest Star has seen Feral sent down to hell to retrieve the soul of head necromancer, Charn-el, while The Gronk has spent weeks climbing out of a blood filled pit he fell into earlier in the story. At one point he encounters a contorted, tortured frame that claims to be Johnny Alpha fused into a mass of writhing figures begging for death. In a scene that proves more successfully moving than his first death (and I wonder if this is the moment that Simon Pegg’s character refers to in Spaced), The Gronk reluctantly obliges him. Despite my reservations, Garth Ennis again writes a Strontium Dogs story that features all of the right triggers while Nigel Dobbyn’s art just gets better and better with each new thrill he draws. 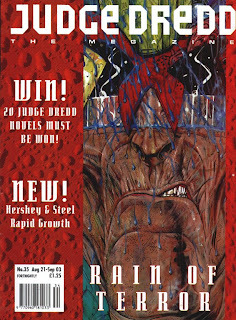 ANNOUNCEMENT: This prog features a couple of advertisements for Judge Dredd The Poster Prog. 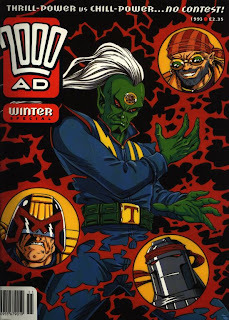 This is the first of a short series of poster magazines that 2000 AD release which go on to include Strontium Dogs, Slaine and Rogue Trooper. I refused to buy these at the time as they were priced £1.50 each and only featured six pages of strip. However, this isn’t the only reason why I won’t be covering them as part of The Slog; it’s because I’ve been unsuccessful getting any for a reasonable price on eBay. Mean Arena is back, although it’s not the series that ran in the early days of the comic with which I had a turbulent relationship. It’s a reinvention, written by Alan McKenzie and drawn by Anthony Williams, in which convicts are forced to take part in battles with each other for the entertainment of the television viewing masses. You might remember that the original Mean Arena was a problem for me but, in the end, I grew to both respect and enjoy its exuberance. The new Mean Arena just hasn’t got very much going for it and that’s not just because it has appeared so soon after a similar idea, Slaughterbowl. There’s just not much, if any, plot and any characterisation that exists is down to Williams’ strong cartooning skills. There might be an inkling of a tribute to or parody of WWE (probably known as WWF in 1993) but the soap opera threads that could be trying to establish themselves are confounded by McKenzie’s spacious writing style.